Conversations and screenings exploring notions of representation, history, subjectivity, and translation. Opens to public – 10/23/2014, 6:00pm. Slought is pleased to present a series of public conversations, talks, and screenings have been organized in conjunction with …Cairo stories, a video and photographic installation by Judith Barry, on display at Slought from September 15 to October 24, 2014. …Cairo stories features a selection of stories from a collection of more than 200 interviews Barry conducted with Cairene women between the US invasion of Iraq in 2003 and the beginning of the Egyptian Revolution in 2011. The installation chronicles personal experiences of women from a variety of social and economic classes in Egypt and expands the artist’s concerns with notions of representation, history, subjectivity, and translation — particularly as these ideas circulate across cultures. 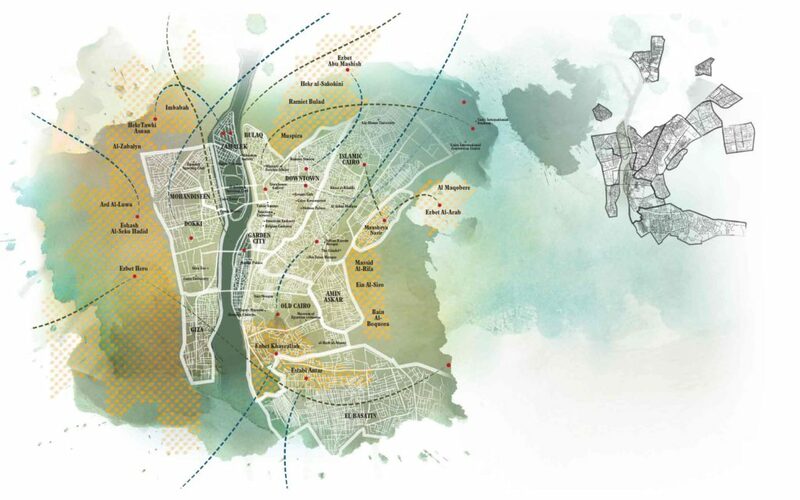 The fragmented, collaged city plan pictured above shows Cairo as it has spread from the banks of the Nile into the desert, the indigenous North African topography. Each moment in Cairo’s history has produced a new city. Cairo is a palimpsest of many different epochs encompassing a geographical area that is approximately 175 square miles, including the informal settlements. During Barry’s many trips to Cairo beginning in 2000, she crossed the city hundreds of times, traveling back and forth across vast distances: from the outer city where informal, working class, and public housing projects are located, to the many centers of Cairo – Pharaonic, Coptic, Islamic, and European – as well as into the gated communities of New Cairo patterned after the Emirates, which some call the Gulfication of Cairo. Her route mimicked the journeys that many of the women in these stories undertake each day as they travel to and from the informal, working class, and more affluent zones of the city. These arrows delineate their daily passage through many different neighborhoods underscoring the uniqueness of Cairo’s fluid historical and cultural diversity. The many journeys foregrounded in …Cairo stories will be the subject of a series of events throughout September and October 2014. These include a public conversation on September 30th at 6:30pm, organized with Scribe Video Center’s Muslim Voices of Philadelphia project, that will feature Anne Norton, Nusrat Jahan Bashir and Judith Barry in dialogue. They will foreground a variety of perspectives that challenge contemporary representations of Muslim life in Philadelphia, Cairo and beyond. Nusrat Jahan Bashir and Judith Barry will begin by speaking about their own work in this regard, and the methodological and philsophical considerations that have shaped and structured their efforts. In addition, Anne Norton will speak to her recent book “On the Muslim Question” and critique the West’s ongoing fear of Islam. See below for a full list of upcoming programs. This illustrated conversation will explore the public’s relationship to image production and distribution in an era of global uprising, and the artist’s role as an agent for social, political and affective discourse within this increasingly contested field.